Whoever has tried the new operating system by Microsoft, Windows 8, will have been able to check that the only Start screen available is Metro, the graphical interface of the OS. This screen is always active and there is no way to deactivate it. Unless you have Windows 8 Start Menu Toggle. The file explorer and the task manager have also been modified. Many users find this new interface confusing and hardly intuitive at all, especially when the operating system is used with computers that don't have touchscreen support. 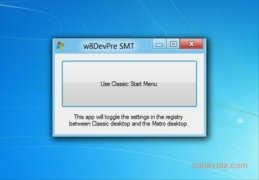 W8DevPre SMT will allow you to transform the interface of Metro into the classic of previous Windows operating systems as well as to use the old file explorer and task manager. Alternate between the Metro start screen and the classic Start menu. 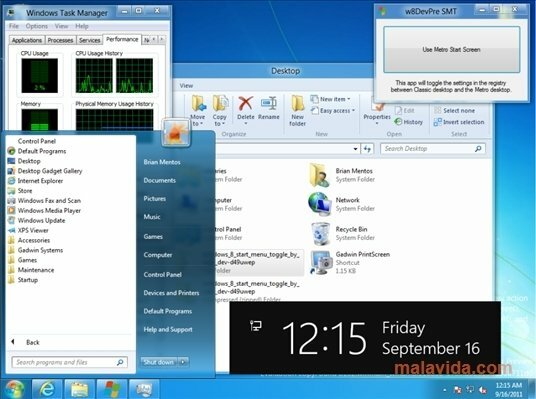 Alternate between the Metro graphical interface and the classic Start menu in Windows 8. Go back to the old Windows Explorer and task manager interface. Easy-to-use. Change the interface with a click of the mouse. Not necessary to modify any registry entry manually. The only thing that you have to do when you install the application is to press the “Use Metro Start Screen” or “Use Classic Start Menu” depending on what you want. The next time you start a session, the interface will change and will look like the old one once again. Windows 8 Start Menu Toggle performs small modifications on the Windows registry file that allow you to change both the Metro interface as well as the file explorer and the task manager. Instead of accessing the registry and performing the changes manually, download Windows 8 Start Menu Toggle for free: it will do it for you. Only works on Windows 8. This download requires .NET Framework 3.5, which will be installed automatically if it isn't on the computer.